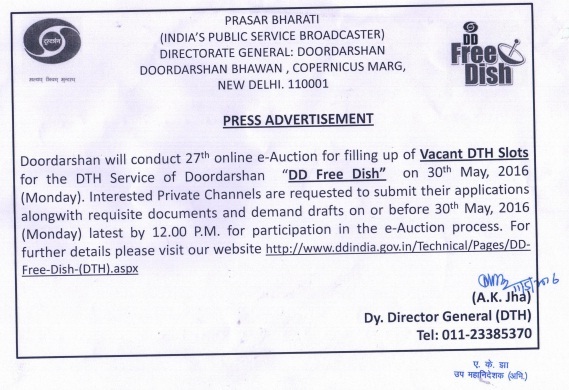 DD Freedish conducting 27th e-auction for filling up "Vacant DTH Slots"
Doordarshan will conduct 27th online e-Auction for filling up of "Vacant DTH slots" for the DD Freedish DTH service of Doordarshan on 30th May, 2016 (Monday). Interested private TV channels are requested to submit their applications alongwith requisite documents and demand drafts on or before 30th May, 2016 latest by 12:00PM for participation in the e-auction process. 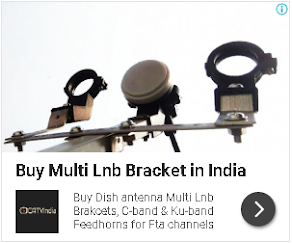 For further details please visit DD India website "www.ddindia.gov.in/Technical/Pages/DD-Free-Dish-(DTH).aspx".